Essential Support for your Computer System (SaaS). The Designer-Software Server Monitor provides continual performance and maintenance checks on your computer network. Functionality alerts are transmitted by email and text avoiding system crashes and computer overloads allowing you to maintain optimum management of your resources and avoid server failure. 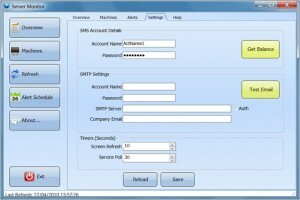 The Server Monitoring software performs a dual function of scanning and reporting data to be read physically on the master monitoring computer, and gathering data remotely to be collected and asset checked without an operator needing to sit in front of the machine. Here is a précis of the Designer-Software Server Monitoring software features. The software has a supporting ‘Export to CSV’ capability that allows data to be viewed in any spreadsheet programme ( Excel, Open Office). Free vs. Used Physical Memory Checks to see your system resources are running as they should. Is there too much demand on one machine – should this be rebalanced across the system? Free vs. Used Virtual Memory Using too much virtual memory means your system is not running efficiently. Performance slows as virtual memory is exchanged for physical memory on your hard disk, reducing the lifespan of your hard disk. Free vs. Used Hard Disk Space File fragmentation increases with low disk space. This slows performance and causes some applications to falter. When a hard disk gets below 20% they get harder to manage and defrag. Monitoring improves a pc’s performance. PC Date Time Alerts Keeping all your PC dates aligned helps with reporting and system wide date issues. Processor Load Tolerance The software reports instances where the processor is in danger of overload resulting in the server slowing right down. UPS (uninterruptible power supply) Alert Mains or Battery switch-over This feature gives warning of a power outage giving you time to put procedures in place before power is lost. Website URL – Page Checking Checking your website pages, either with a full or partial check to make sure they are running properly. PC Service Running Each machine is reviewed within your network to ensure their ‘services’ are operating properly. The software can be set to immediately warn of any service error or to send an alert after the service has been ‘down’ for a period of time. File Date – Age Monitoring Backup files need to be monitored to check their age. This function warns of processes not running as they should. Machine ‘Alive’ Alert A real-time check to ensure each machine is running on your network. If your server is down for any reason, the processes to be undertaken by a particular machine can’t proceed. Global Defaults Adding each new server is a quick and easy process, with the master monitor being able to make central updates Internationally. Custom PC Specific Override If you don’t want to use the standard defaults it is a simple process to copy them to a specific machine configuration and customise them to a particular machine. Active/Inactive Date Directives Alerts can be scheduled to allow for different shift working or people being away from the office for any reason – on holiday for example. Data collection without an operator physically connecting to each item. Automatic data collection and checking saving time and improving system operator management. Please contact us trial and for pricing.